Tjitte Weistra is not only a great coach – or only a great columnist for Badzine – he is also a very talented player, as he showed by winning his first title in the World Senior Badminton Championships, in one of – if not THE – toughest category: men’ s singles over 35. Tjitte was kind enough to write about this amazing experience, for you, Badzine readers. Enjoy. By Tjitte Weistra, Badzine columnist and World Champion. Photos: rights reserved. 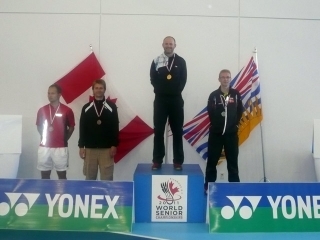 Right, so all of a sudden I’m a World Champion, which is quite a unique feeling, but I do have to put it in perspective of course as it was “only” the 35-40 age group world singles title. The BWF World Senior Championships has been quite a special experience from various perspectives. First of all, I felt fortunate to still be playing at this level at 35 years of age, secondly to have the opportunity to meet so many friends from “back in the days” and last, but certainly not least, the atmosphere and spirit the event is being played in. The best example I can give to try and explain the spirit was the final of the women’s singles 60-64 age group final between a player from Germany and a player from France. The match went all the way and was decided by setting in the third game. Rallies were incredibly intense, the crowd was extremely supportive to both players and when the match was finished both players hugged each other, then shook hands with the umpire and service judge and then with all the line judges around the court before taking pictures together on the court. The shaking of hands with line judges is of course highly unusual in international events but it was something that I found very interesting. It made such an impact on me when I first saw this happening at the start of the tournament that I started to do this myself as well after every match. All players came to this event to compete as hard as they could, to try and win and to leave everything on the court but the camaraderie, the friendship and the sharing of simply feeling fortunate to stand on court to compete was what probably defines this event. I came to this event feeling excited about the opportunity to meet old friends and to enjoy competing. I enjoy competition, it makes me feel alive and the feeling of giving it all regardless of the result is just simply satisfying ( I do hate losing by the way 😉 ). I enjoy playing badminton. I will always believe that it is the most satisfying and complete sport on the planet. The difference between now and “back then” is that I no longer put any pressure on myself. I just enjoy the opportunity to play, which helps keeping the body and mind relaxed. 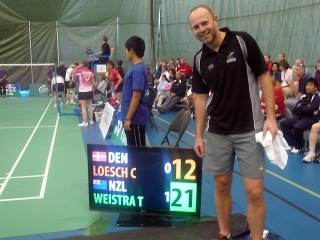 In my final against Carsten Loesch from Denmark, I believe this was the key difference. I was relaxed and visibly enjoying myself where he was tense and subsequently irritated when things didn’t go his way. He came to the event to win the gold medal where I came to compete and to enjoy myself. I guess we all know that being relaxed helps performance. A state of relaxation also allows you to focus on what you can control and not on the uncontrollable. (Sport) psychologist will always tell athletes to focus on things that can be controlled. The Richmond Oval in Richmond, Vancouver, Canada is one of the biggest stadiums I have ever seen and played in. The draft inside the stadium is significant and keeping the shuttle “in sight” can be challenging. It was the “talk of the day” when we had the opportunity to practice. All players commented on the draft, the visibility and were worried how this would affect the tournament. The tournament organisation, however, did a fabulous job at minimising the impact by putting up large curtains around the court arena, which made a big difference. But, as always in these kinds of stadiums, there will always be a draft and a lot of players just couldn’t find their rhythm. When this is the case, a player has two options: to accept and deal with it or to keep complaining. As it is something you cannot change but can only control to a certain extend by adjusting your shots when necessary, you need to simply accept it and move on. Complaining will lead to frustration and in most cases to losing the match. The reason why I managed to stay relaxed and focused without being bothered by uncontrollable factors is probably that I have reached a stage in my life where there are bigger and more important things than winning a game of badminton (remember, I hate losing 😉 ). Having my wife and 3-year-old daughter sitting right next to my court and cheering me on makes all other things look insignificant. No matter the result of my match, when the match is finished my little girl will still come and run towards me and give me a hug. For players, whether currently competing on the international circuit, in the Super Series or the like, or playing at local club level, the trick is how to get themselves into that kind of space: the mindset in which you are relaxed and completely in control of your emotions because you are able to shut out things that cannot be controlled and can focus on the small things that make the difference between winning and losing. This state of relaxation is not to be confused with a casual “I don’t care” attitude. I have mentioned twice now that I hate losing and will fight as hard as I have to in order to win but at the same time it is not stressing me out because I can eliminate any thoughts with regards to the possible consequences of the result of the match from my mind. “Time-travelling” is a player’s worst enemy. Thinking about the past (lost points, missed shots/opportunities) or thinking about the future (what if I win this point/match, what if I don’t) during a match can have a very negative impact on your performance. The trick is to always stay in the “NOW”, to take it one point at the time and to stop any negative thoughts from creeping into your mind. The above seems easy but of course it is not. I also have the occasional “brain-explosion” and can get very angry with myself but most of the time I keep it together. Now the two-year wait begins until the next BWF World Senior Championships. I would like to thank Badminton Canada and the BWF for hosting this event and I cannot wait to participate again in 2013, to meet more old friends and of course to try and defend my title. 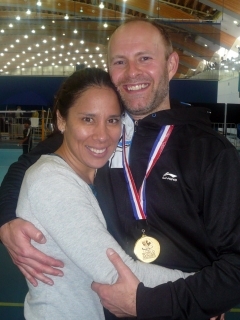 A special thank you to Tony and Karen Knott from the organising committee for their amazing hospitality. I appreciate it very much and New Zealand is waiting for you!! !